Select: Select a Section Can I Afford a Microbubble Tub?Swollen Lymph Nodes & IchthyosisUFIRST Scholar Talks College Prep & IchthyosisWeak Teeth & Ichthyosis: Is there a connection?What is Cyberbullying? Where would we be without the kindness, compassion and generosity of others? It never ceases to amaze us how people are so moved and inspired by the FIRST community – so much so that they are compelled to reach out and offer their services and skills in any way that might help. 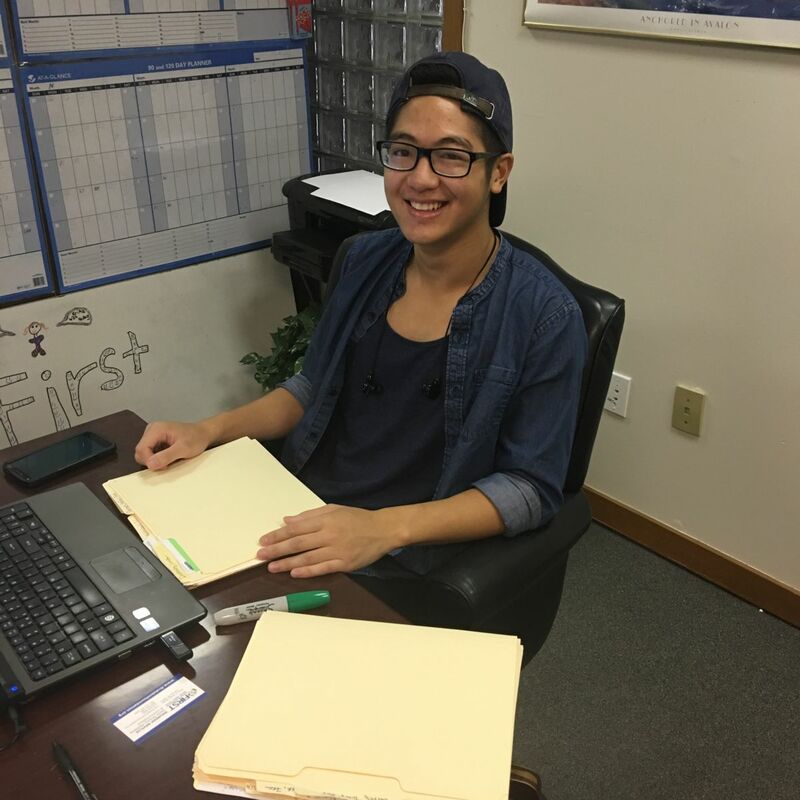 This summer, we’ve been privileged to be the recipients of one of these kind and generous souls, a local young man named Sigfried Aragona, who volunteered during his summer break, both last year and this year, at our Colmar national office. Perhaps you’ve seen him on our Facebook page, because “Sig,” as friends call him, was willing to do just about anything we needed to keep our RAISE campaign thriving, and equally as important, to keep our mission to educate, inspire, and connect all those affected with ichthyosis, alive and well. When he was asked to handwrite the addresses on 200 envelopes and 50 thank you notes, (the mere thought makes my carpal tunnel ache), he said, “Sure sounds good!” In fact, he sat down promptly and got straight to work. Even when we requested the extreme, Sig obliged with a smile. With his cheerful attitude and overly abundant willingness to help, Sig has been an absolute gem and a blessing for the office, two summers in a row. In fact, we’ve been in a bit of a “gratitude haze” about Sig. So much so that we had never really asked Sig what inspired him to contact us? Surely there were other organizations to which he could have volunteered. We didn’t even really know precisely how or why he found us, even though we are eternally grateful that he did. We sat down with him to find some answers. We were pleasantly surprised that this kind young man had observed, and subsequently was drawn to FIRST, in the very same way and for the very same reasons as the FIRST staff, members, partners, doctors, and many other volunteers themselves. But that’s not all. Sigfried Aragona, like FIRST, has a big, beautiful world-changing mission of his own. How did you discover FIRST? SA - I am a nursing student at West Chester University. I wanted to volunteer somewhere that was health-related, in the nonprofit arena, and truthfully you popped up at volunteermatch.org as a local advocacy organization. And I lean towards advocacy because it is a passion of mine. That’s what brought me here the first year. Learning about your mission is what brought me back this time. Why advocacy versus a clinic or healthcare facility? SA – The idea of filling in the gaps of health disparities for those who are not getting support of health insurance, health care providers, or other governing voices, is my passion. Later down the road, I’d like to do advocacy for the LGBT community. I’d like to work for a medical organization addressing specific disparities in that community, but I haven’t narrowed that down yet. I also aspire to complete George Washington University’s LGBT Health Policy and Practice Program, as a part of my post-undergrad education. Policy and ethics is a realm of nursing I am very interested in. And working at an advocacy organization like FIRST will help me to get the perspective of how patient advocacy fits into the ethical experience of healthcare. Have you made any observations, learned anything new, or had any revelations since you’ve been volunteering here? SA – Yes, many things. But one thing that stands out to me is that I think it’s interesting that FIRST has a very ambitious and big mission, and has made huge strides, with only six women, working in a small office above a dentist office. It strikes at the core of what advocacy should be. It doesn’t have to be grandiose. FIRST, no doubt, has a purpose – it’s as simple as that. How was your passion for advocacy inspired? SA – My passion for advocacy came from my experience as a member of the forensic speech team. The definition of forensic is the dissection of things. So this team focused on the dissection of ideas. Political, social, and philosophical. The district of the team ranged from New York to Ohio to Virginia. There were poems, interpretive performances, speeches, etc. So I heard a lot of presentations, in very unique ways, about communities who have not had a voice. I have found an outlet through this speech team community and it opened my eyes to the idea that it is necessary to hear the caliber and the many different perspectives of these issues to really understand. Once you hear these stories you want to do something. You want to help. I now want to turn my career into an advocacy experience. I want to find my unique place in the world. Ultimately, I want to connect the narratives and provide a support system in the same way you do here at FIRST. Please join us in thanking Sigfried for his many contributions, as well as all the generous volunteers at FIRST. Your time, talents, and warmth provide support for our community, today, tomorrow and for many generations to come. And…you, no doubt, have purpose. It’s as simple as that. Can I Afford a Microbubble Tub? Weak Teeth & Ichthyosis: Is there a connection?